After coughing and sneezing up a storm for the first four days of our holiday (and the ten days before that), we finally laced up our running shoes this past Saturday - the beauty of the Cape needed to be run! 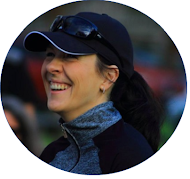 I'd arranged with Lisa from Lulu's Big Adventure, who is currently in South Africa for part of her medical studies, to meet Miss K, J Bear and I at the Rondebosch Common parkrun near our hotel - parkrun Number 14 and parkrun Venue Number 3 for us, woohoooo! It was a lovely, cloudy day in the Cape, and the four of us lined up with 500+ (!) other parkrunners for two laps around the Rondebosch Common. As you can imagine, it was quite a crowded affair, and as a result we walked for most of the first kilometre. Things thankfully spread out a bit after that, and we chatted and ran and enjoyed the beauty of Devil's Peak in the background for the remaining four kilometres. It was so nice to finally meet Lisa (I've been following her blog for more than a year now) and to hear about some of her adventures in person - wishing her a lovely stay for the rest of her time here in S.A.! 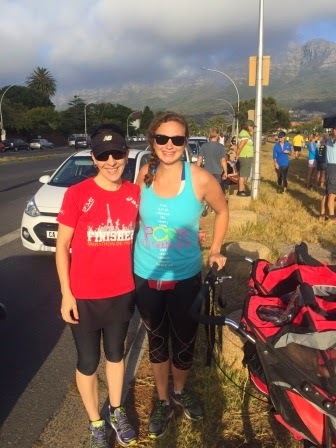 Rondebosch Common parkrun with Lisa! If you've been following our adventures for a while, you'll also know that Will has been chasing a sub-3 hour Cape Town Cycle Tour for four years now, and that he's very narrowly missed that goal on all four occasions. The main reason for our visit to Cape Town was also then Sub-3 Attempt Number 5 - yep, we were going for it again. Except this time things took a very unexpected turn: Extensive fires on the Cape Peninsula (the venue for the Cape Town Cycle Tour) caused race organisers to shorten the race distance from 107 km to 47 km at the last minute (the Wednesday before the race, actually), giving Will an "automatic" sub-3 time (there was no way that he was going to spend more than 3 hours riding only 47 km). That was, of course, not the sub-3 he'd hoped for, so I guess we'll be back again next year for another attempt at a proper sub-3! And so, after five glorious days, countless memorable meals, an automatic Sub-3 and a parkrun with a new friend in beautiful Cape Town, it was time to say goodbye. Thankfully we were not headed home just yet - we had seven more days of sun, sea and fun to look forward to in Hartenbos. See you soon, Cape Town! And it was too bad about the race, but hey, lucky number 6!! Glad you enjoyed the chocolate bar - one of my favourites! :) It was so lovely to meet you. Arghhhhh, this sub-3 business is making me grey before my time...! What a pity for the change of the program about the race distance. I love the Parkrun but in Italy this kind of race is unknown. So fun that you got to meet someone whose blog you've been following for so long! I feel bad for Will! Poor guy just wants his sub-3. He'll get it though. The fact that he's keeping at it after five tries shows he's persistent and will break that barrier no matter what :). Ha I love how Miss K is riding in style in that last picture. I'm sure our poor porter didn't know what hit him, haha! 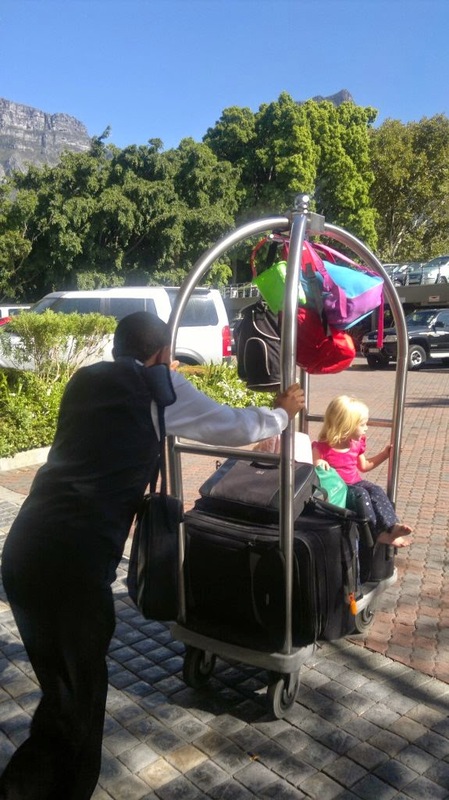 Dora bags and beach buckets swinging from the top of the trolley, plus a little passenger :) . She really enjoyed it, though!